1883 Aktiebolaget Separator (AB Separator) was formed in Stockholm by Carl Gustaf Patrik De Laval and Oscar Lamm, which later adopted the trade name Alfa-Laval. The De Laval Cream Separator Co. was formed in the USA. 1889 Acquired the patent for conical metal discs by Clemens von Bechtolsheim. By using these so-called Alfa-discs, the separator's capacity was increased many times over. 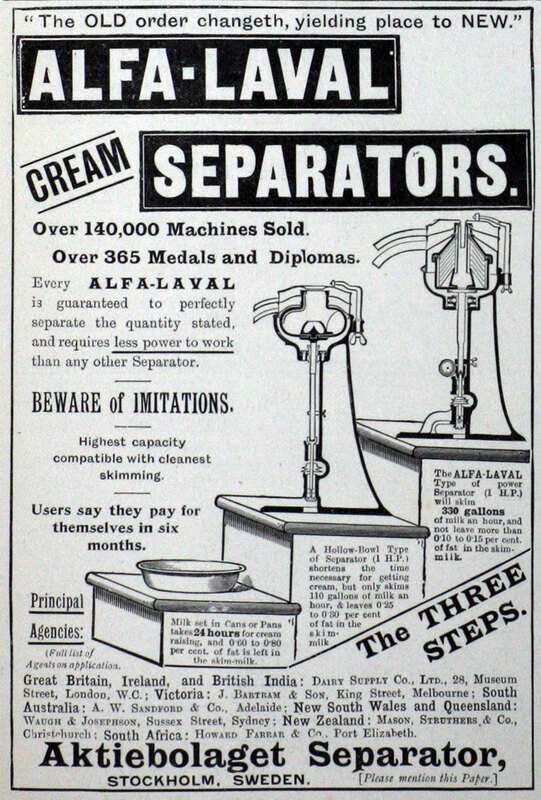 1890 Introduced the world's first continuous separator using the Alfa disc stack technology. The first continuous milk pasteurizer was introduced. 1916 Alfa Laval sold first separator for oil purification. 1928 Shares in the Swedish company were admitted to the London Stock Exchange. 1938 Introduced Alfa-Laval's first heat exchanger. 1963 The parent company changed its name from AB Separator to Alfa-Laval AB - Alfa from the alpha discs and Laval from the founder of the company. 1991 Tetra Pak acquired Alfa Laval. 2000 Industri Kapital bought the Alfa Laval Group. 2002 Alfa Laval was quoted again on the Stockholm Stock Exchange. This page was last edited on 11 January 2019, at 12:23.